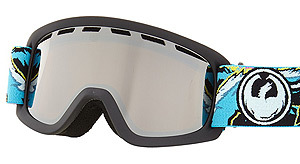 Snow goggles provide protection from the brightness of the sun, from ultra violet rays, from snow ingress and from the wind and cold. They can also help increase contrast in low light to help you avoid bumps and other obstacles. The light at high latitudes and altitude can be very bright and dazzling, especially when it reflects off snow and ice, bathing you in a sea of ultra violet rays. We can't see these uv rays and so are aware of them in the way we are of visible light, It is possible to become sunburnt or get snow-blindness on a cloudy day if you don't protect your eyes properly. Fortunately technology and fashions have progressed since the first snow goggles as modeled by the gent to the right were developed. His are made of bone, though other similar Inuit designs were made from wood or antlers, a simple slit reduces the amount of light and blowing snow getting through. Even today mountaineers and explorers can improvise similar designs from cardboard, duct tape and string or whatever else they have to hand if they lose their modern eye protection. Goggles are more effective than sunglasses as they prevent light from creeping in behind the lenses, they prevent the snow piling in if you suddenly contact it more closely than you anticipated or if it starts to snow and blow. They are better with a helmet than glasses and contribute to full face protection in the coldest conditions. When the weather is not so sunny, goggles with lighter lenses help to increase contrast enabling you to see detail in the snow surface, lumps and bumps that would otherwise be a featureless expanse of whiteness. Double lenses -There are two lenses with a gap between them which is sealed along the outer edge, it helps to prevent fogging on the inside of the lens. 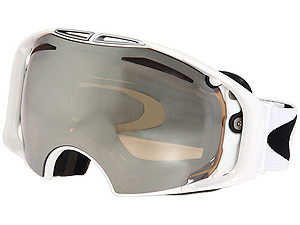 Changeable lenses - two lenses with your goggles are recommended (see below) many goggles make changing lenses easy to do should conditions change when you are out, allowing flexibility for minimal weight/volume in carrying the extra option. Wide easily adjustable straps - for comfort and to adjust to fit round your helmet quickly. Cylindrical or spherical lenses - cylindrical lenses are curved vertically (think bottle) for improved peripheral vision. Spherical lenses take this a step further being curved horizontally as well (think snow-globe) which helps to reflect glare from the sun improving vision even further. High comfort face-foam - the bit that contacts your face and spreads out the load for increased comfort and day-long wearability. Ultra violet protection - there's a lot of light and especially ultra violet light about at high latitude and high altitude, most modern lenses offer 100% protection against these for your comfort and safety. You can get goggle lenses in any colour you can imagine including mirrored finishes that are multi-colored and change their hue according to your viewing angle, largely they are a matter of personal taste, though there are three distinct categories of lenses. Darker lenses - for high light conditions when the sun is shining and reflecting off a world of white. These lenses are often grey, dark brown, blue and/or mirrored which is sometimes called "iridium" where the color of the lens changes with viewing angle. The mirror finish reflects much of the light falling on the lens. 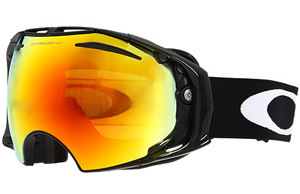 Dark lenses are one of the must-haves with your goggles. Lighter lenses - for cloudy days when they fulfill the cold protection brief and also help to increase contrast in the snow so making detail clearer. These lenses are usually yellow, orange or pink and are much lighter letting in about twice as much light as the standard dark lenses, these are the other must-have lens with your goggles. Many modern goggles will come with two lenses, one lighter and one darker and a protective pouch to keep the one you're not using in so that it doesn't get scratched in your back-pack. Clear lenses - transparent for night-time use. The actual color of the lens is of secondary importance, it's how much light it lets through that is the main thing. So you can be discrete in your goggle choice or any where along the spectrum to a color changing alien bug-eyed monster look. 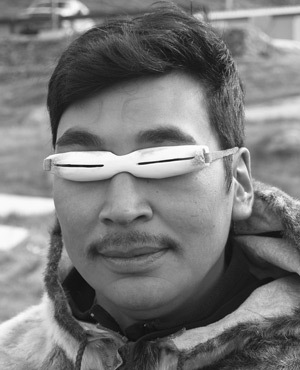 Picture use, copyright picture of Inuit man with traditional snow goggles used courtesy of - Julian Idrobo from Winnipeg Canada, under Creative Commons 2.0 Share and Share Alike generic licence.